Outryder isn’t a bourbon or a rye. It’s classified as a “Straight American Whiskey,” which has some of the same requirements as bourbon and rye, but doesn’t have to adhere to either strick mash bill. 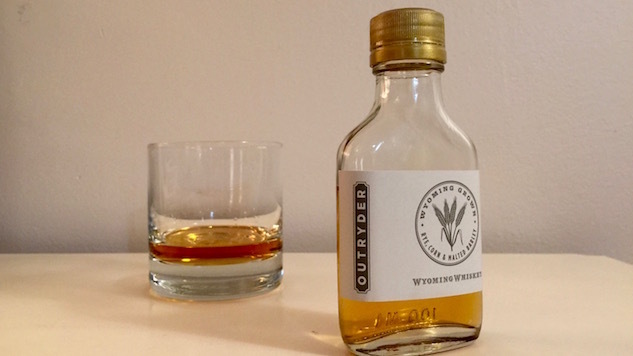 For Outryder, Wyoming Whiskey mixes the mash bills of two different whiskies, ultimately using a mix of winter rye, corn and malted barley, all of which were grown in Wyoming. There’s not enough rye to call the whiskey a rye, and not enough corn to call it a bourbon. So it’s Straight American Whiskey, which sounds vague, but in this case, it’s damn good. Essentially, with Outryder, Wyoming Whiskey has managed to blend the best characteristics of rye and bourbon in the same bottle. The first sip is full of that rich, butter I found in the nose, but also a bit of honey and maybe even banana up front. The mouthfeel is smooth and round, delivering all kinds of sweetness, until the rye kicks in and whisks everything away with a long, peppery finish that has a faint hint of cinnamon. It’s thick and slippery, a bit like the honey I’m pulling out of the profile. The spice lingers a bit, too. Add ice to the glass and some of that spice takes a back seat while the sweet notes come on strong, showing new layers of toffee and vanilla. It’s 100 proof, but drinks like a softer booze. There’s no age statement on the bottle, and guessing by the color, I’d say it’s a young whiskey, but it has big flavor from the mash bill and whatever time it has spent in the barrel. That said, I’m excited to see what comes out of a young distillery like Wyoming Whiskey, once they’ve let some of their whiskies mature for five, 10 years, or longer. This is easily my favorite spirit from Wyoming Whiskey, and one of the best new whiskies I’ve had in a while.